Audio Addiction Ltd proudly presents Darude! He's certainly no stranger to the Garden City as Darude has played at many sell out events here over the years. Catch the EDM Powerhouse at the newly renovated D4 venue where he'll be dropping his red-hot hits in full force! 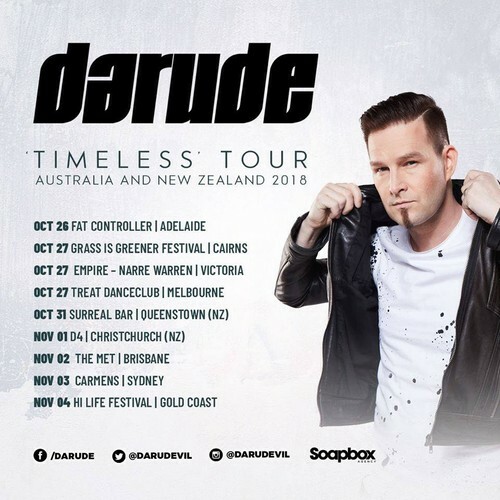 Hailed by the likes of DJ Magazine as “Finland’s biggest musical export” & famed for global hit Sandstorm, Darude has gone on to perform in front of audiences up to 100,000 people strong, sweeping across continents and rocking clubs the world over. From appearing at prestigious festivals and events such as Tomorrowland (Belgium), LA Music Festival (US), Radio 1's One Big Sunday (UK), Utopia Music (Australia), Laserpoint (Finland), Groove Cruise (US) to headlining some of the world’s best clubs including Ministry of Sound (London), Spundae (Hollywood), Rain (Las Vegas) and Government (Toronto). With three artist albums, one compilation, numerous awards and multiple world tours under his belt, as well as a sizzling record label to focus on, Darude’s presence in the world of electronic music remains an ever prolific one, which continually sees him pushing the boundaries and igniting audiences around the globe. Great mix of genres from Funky House, Techno, Trance through to Hard Trance! Round up the troops, book Friday off & make it a long weekend. This will sell out so get in quick and book your spot on that dance floor!